We had been scoping out some new Downtown Minneapolis locations when I heard from Beryl and her mom. There is an area near Loring Park and the Basilica of St. Mary's that I had heard about that sounded perfect for a senior session. Beryl was looking for an urban location, and we were excited that she was willing to humor us! 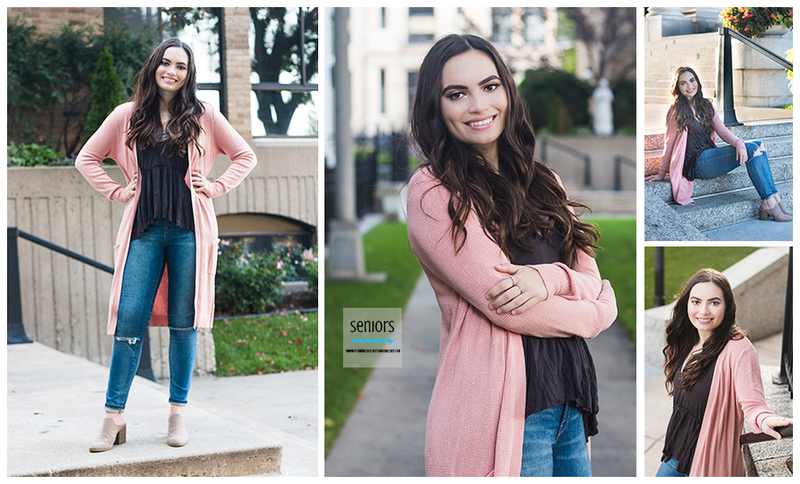 Beryl is a senior at Elk River High School. She is a member of the National Honor Society, Golf Team and French Club! Whew! She is definitely a busy girl! We started out in Loring Corners near Loring Park. There was a fun little alley behind the restaurants with great backgrounds! I loved Beryl's outfits and accessories for each of the locations. Such a beautiful girl! She really reminded me of a model or movie star! Here are a few behind the scenes pictures from the session that my daughter, Baylee took with my cell phone. Beryl also did her own makeup, which looked fabulous! If you don't feel confident enough in your makeup abilities, we are now offering that as an add-on with your session! Baylee does amazing makeup application! We then headed to Loring Park, which was just across the street. I have a nice changing tent that pops up anywhere so she was able to change at the park. As I mentioned, it was the first time at this location for me. I normally don't like to "go in blind", but nowadays with Google Earth you really don't have to. She brought a beautiful wide-brimmed hat which is my new obsession. I have had many girls in the last couple of years wear them and they look fantastic! She told me she wanted accessories that looked cute, but still made her feel like herself, so she kept it simple. We found the bridge over to the Walker Art Center (Cherry with the Spoon) and stopped for a picture in front of St. Mary's Basilica. Our final stop was on the grounds of the Basilica itself. Beryl's parents were married at the Basilica and they wanted to incorporate that into her senior session. What a beautiful location! Beryl's advice for other seniors getting their picture taken? "Wear something that looks cute, but also makes you feel confident in your style." Great advice! And Beryl rocked her look AND had confidence! Beryl's plans after graduation are to attend college. I am so glad she decided to book with From Moments to Memories for her senior session! Good luck, Beryl, in all you do! I see good things in your future!